Looking for a twist on traditional bridal flowers? These presentation wedding bouquets are irresistibly lovely. 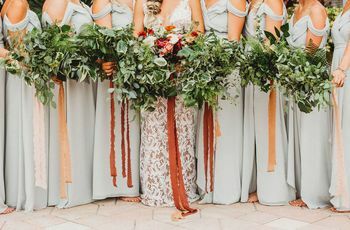 Presentation wedding bouquets (also known as pageant bouquets or arm sheaf bouquets) have mostly flown under the radar in favor of round and hand-tied bouquets, but we hope that's all about to change. 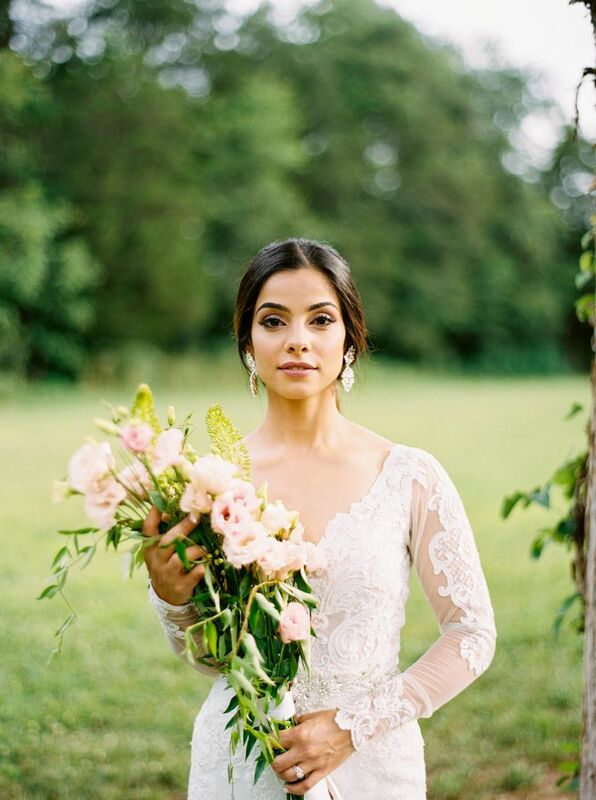 This gorgeous style — named for the way it's cradled in one arm like a pageant queen would do after being crowned victorious — is as versatile as any other wedding bouquet shape. 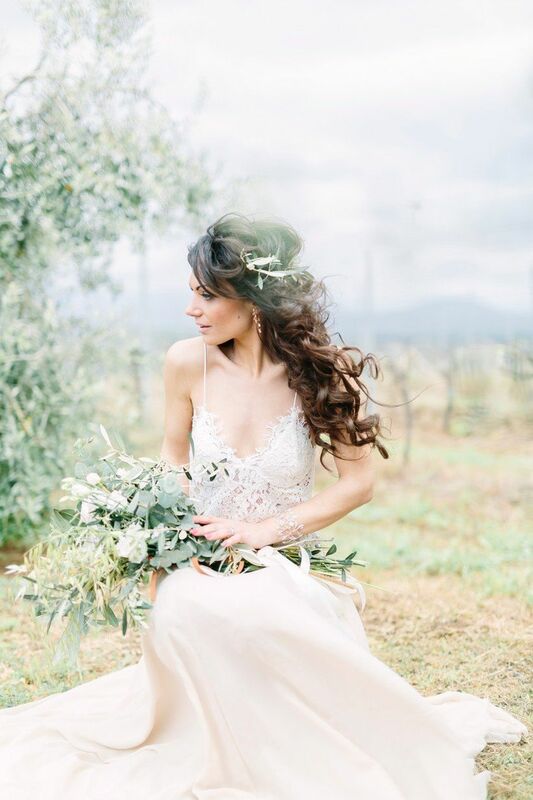 The upside is that it's more unexpected and unique, making it the perfect choice for any trend-savvy bride who wants to stand out just a little bit differently on the big day. 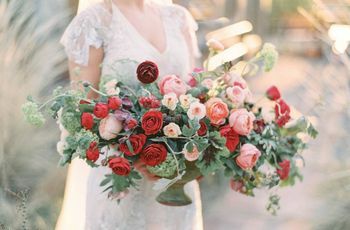 Take a peek at some of our favorite presentation wedding bouquets below. 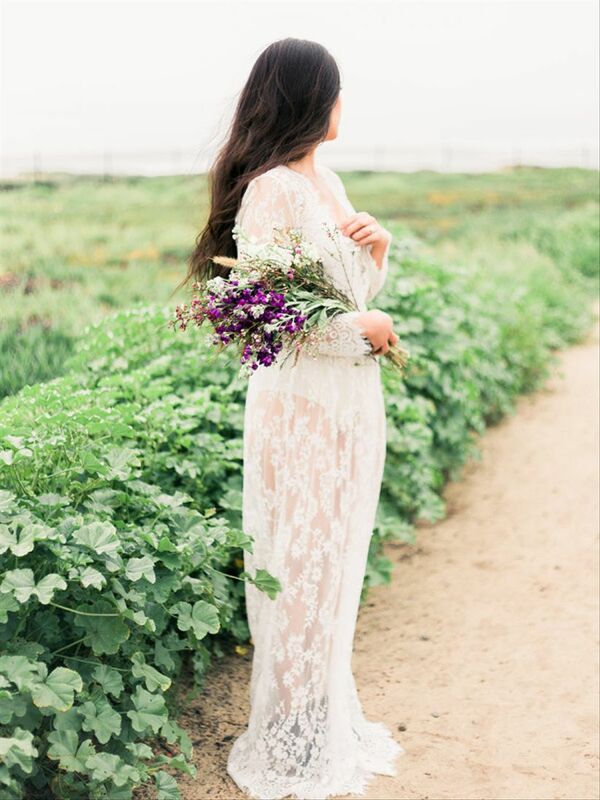 The return of color is one wedding trend we've been so excited to see in recent months. This cheery wedding bouquet of blush lisianthus and playful foxtail lily shows exactly how to incorporate a splash of yellow (one of our fave of-the-moment hues) without feeling over the top. Blue delphinium is like a breath of fresh air for your wedding bouquet. It looks especially beautiful when paired with soft pastels and greenery, like peonies, garden roses, lamb's ear, and pittosporum. 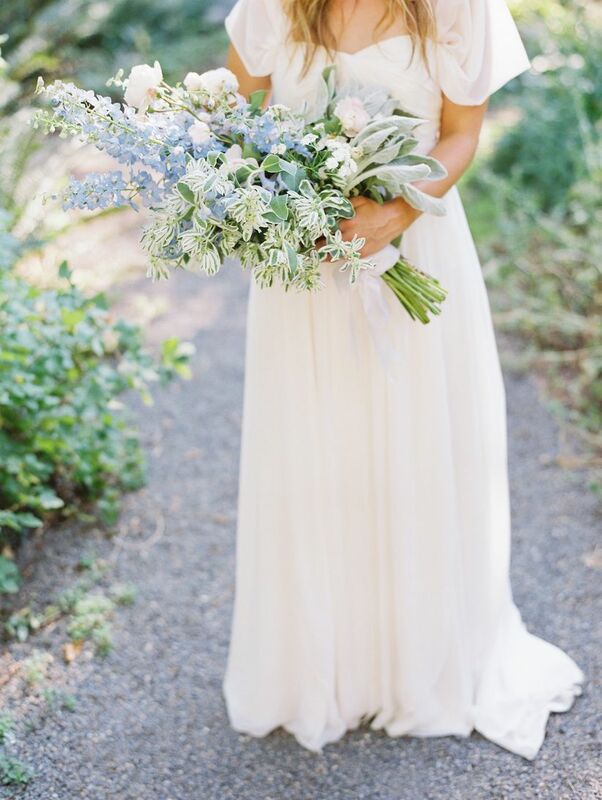 Will greenery bridal bouquets ever go out of style? 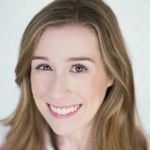 A long-stemmed assortment brings a bit more polish to the average bundle of greens while still creating a perfectly undone look. Turn your presentation bouquet into a true statement piece by adding long ribbons to the stems. 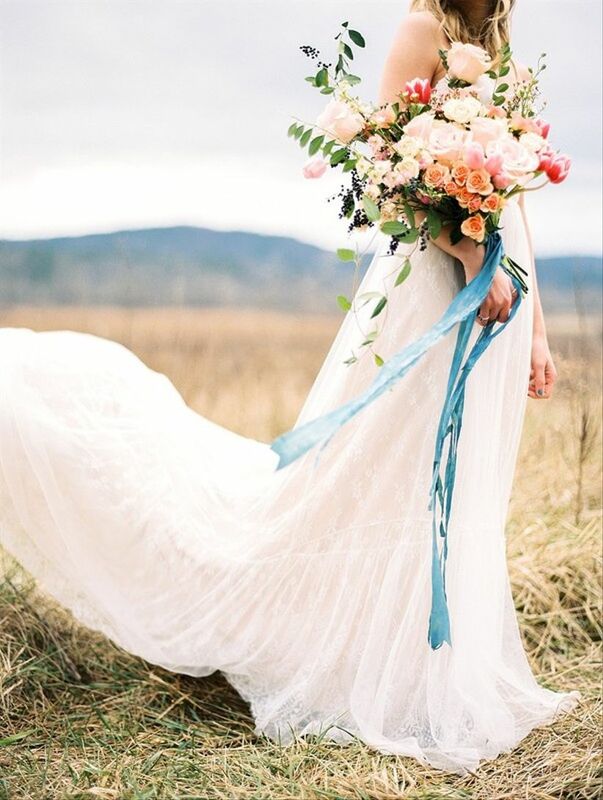 Use ribbons in varying lengths and choose lightweight fabrics, such as raw silk or gauze, for the prettiest effect. Choose a contrasting color for even more punch. 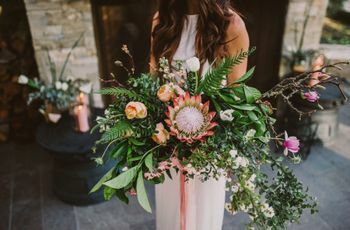 Even if you don't use actual wildflowers in your bouquet, you can create a similar effortless vibe by keeping the flowers loose and adding dried accents. Use long-stemmed flowers in jewel tone colors to create a presentation bouquet that's rustic chic and earthy. Blooms like chrysanthemums, thistle and gooseneck stand out against the green color palette of mixed eucalyptus. 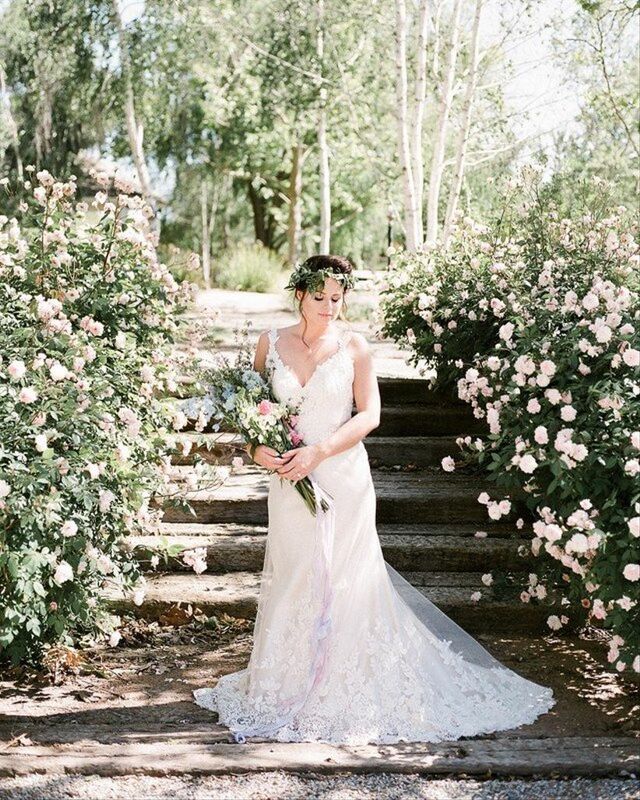 Stack your wedding bouquet in a "tallest to smallest" pattern, which creates the impression that you picked the flowers right from the garden and carried them down the aisle. 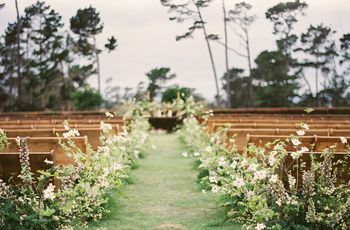 This idea works especially well if you're getting married at a wedding venue that grows its own flowers! 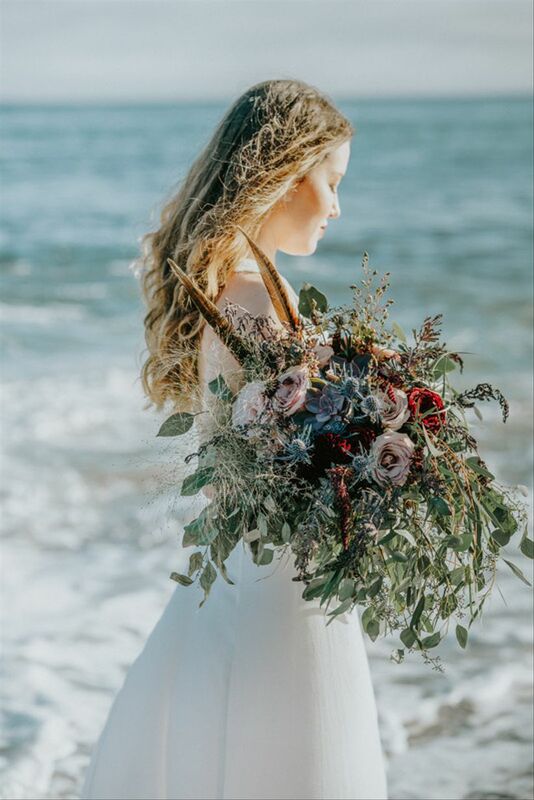 An over-the-shoulder arrangement is definitely not something we see everyday in terms of wedding bouquets, but for the bride who wants something out of the box, this fits the bill! 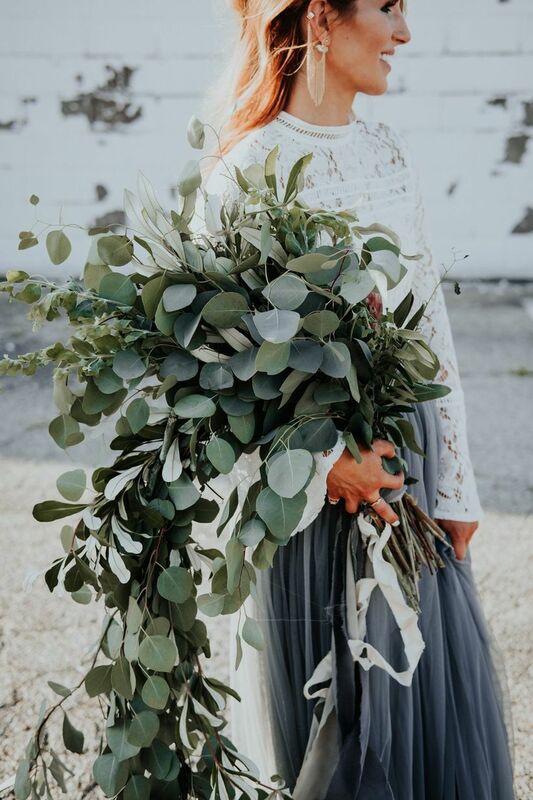 If you love this concept but not the size, you can recreate this bouquet on a smaller scale by using untamed greenery that drapes across your arm instead of your back. 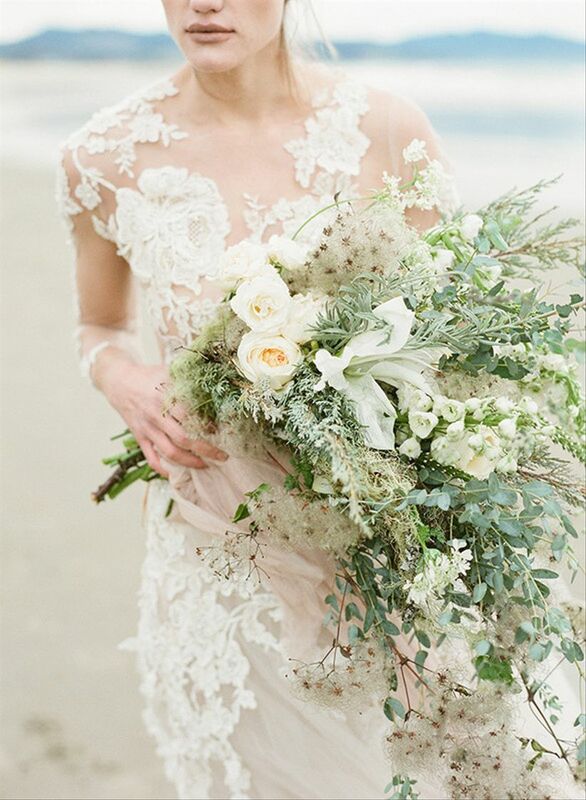 We're crushing on this modern, romantic bouquet comprised of all neutral colors. Pair greenery and herbs with flowers, then tie everything together with a barely-there blush ribbon for a beautiful end result. This bouquet is filled with roses, campanula, parvifolia eucalyptus, rosemary, and dried accents. 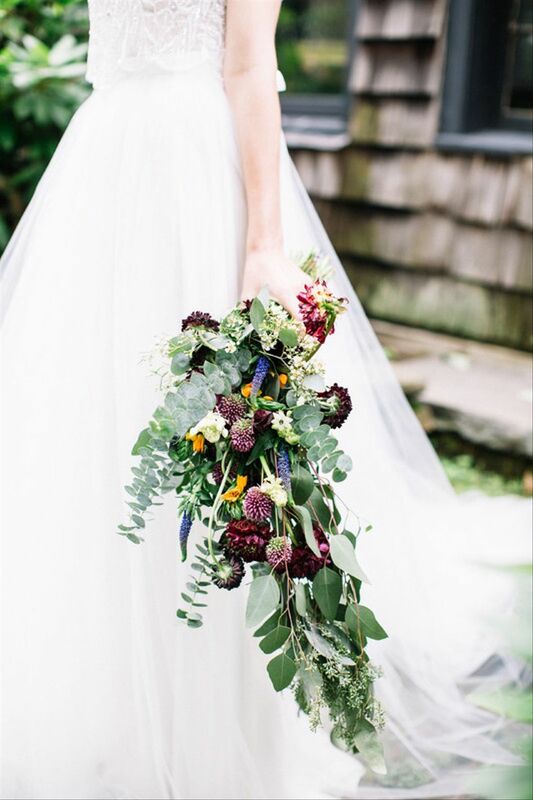 This purple-hued bouquet is a perfect match for another trend we're loving: moody wedding colors. Add contrast by incorporating lighter shades of purple flowers with white berries to break up the darker foliage. This no-frills bohemian bouquet is proof that sometimes, less is definitely more. If you don't want an overdone floral bouquet, a few stems of greenery tied together loosely with a ribbon is just as beautiful. 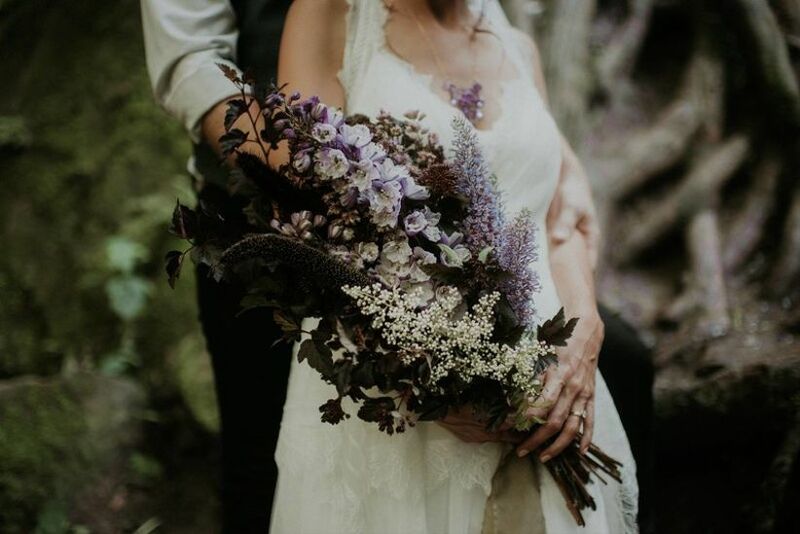 No two wedding bouquets are exactly alike, but you can make yours totally your own by incorporating foraged accents (things you find in nature) like wildflowers, tree branches and even feathers. 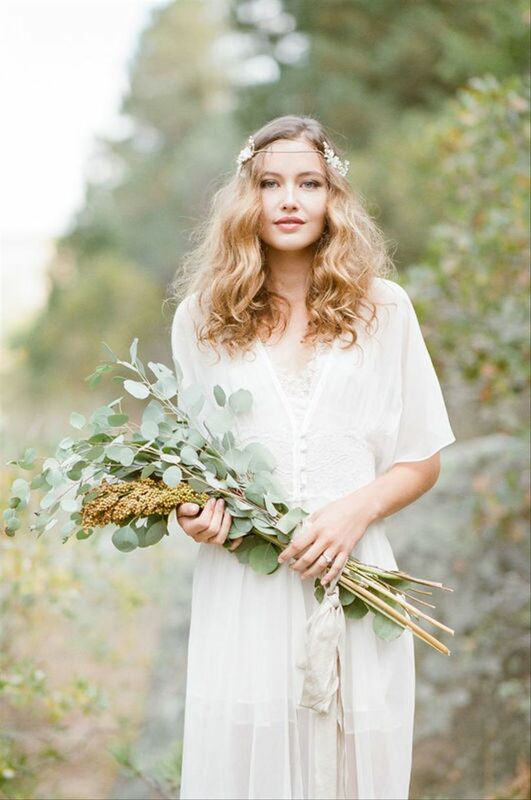 The ornamental grasses, succulents, and feathers in this lush arrangement go perfectly with a boho wedding theme.